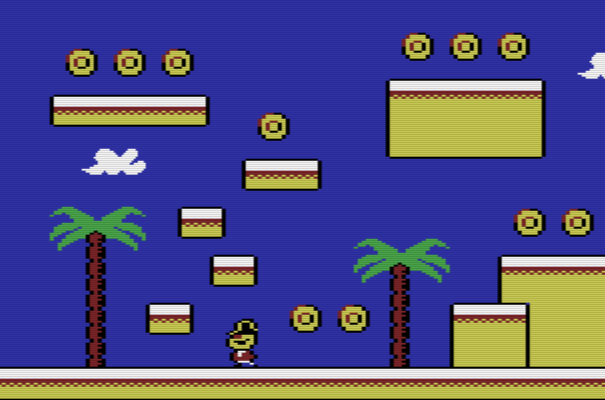 I've been working on and off on a flick screen platformer for the Atari Lynx, Commodore 64, Commodore Plus4/C16 (+64k ram) and VIC-20 for quite a while, it's going to be called Baron Lovejoy Travels in Time. I got this megalomanic idea when I saw a developer called "Misfit" from Finland releasing his game Rodmän for several old home computers. Since then I've seen more similar multi platform projects on the web. It's too much fun getting to understand better how some of the classic systems work and how to create games for them. I've been wanting to create a platformer for ever, and I've started a few over the years but never finished one. Now with more experience on how to actually being able to finish some small games, I'm determined to finish this one! Even if it'd take me years! The main character is a plump rascal, Klaus "Lovejoy" von Kleinschnabel, the world renown painter, astrophysicist, musician and poet extraordinaire. Even though he's a bit of a hedonist his heart is good. He's built a time machine driven by steam which he and Countess Mimi uses to help & free people in time and space. The notorious time police is after him because he is a "lazy dreamer" and his groove of freedom and love threatens those in power. To proclaim himself Baron (free man) was the last drop for the Machinerists who means to own and control every man. I want the game to have an unapologetically cartoony style that is clear and easy to read. 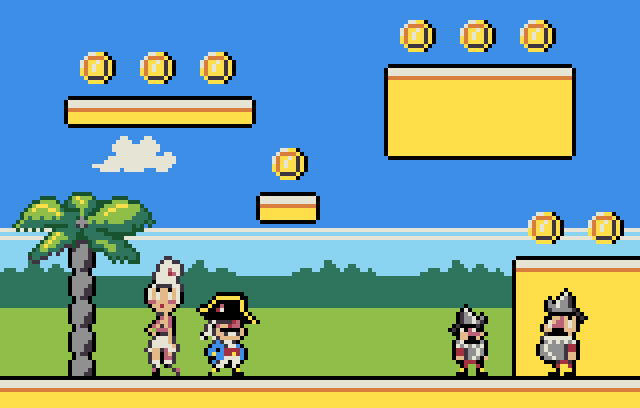 I want to keep the gameplay super simple, perhaps early arcade style, kind of in an archetype platformer style. 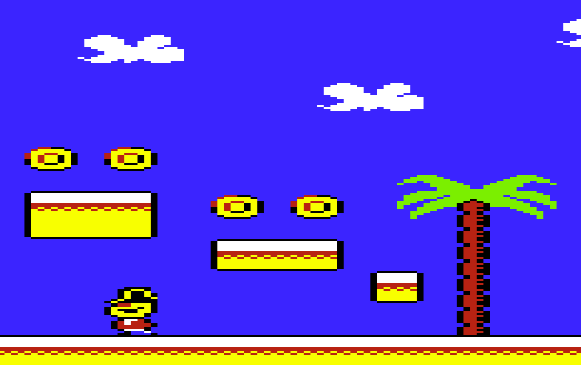 I've been reading about game design lately, and some complain about "generic platformers" now a days, but I grew up with Bruce Lee and such on the C64, I love simple platformers, so I'm gonna create the game I would want to play myself. I can't, and I'm not trying to compete with the recent AAA titles released on many retro systems. I'm an artsy fartsy type, so I don't care that much about fps and pushing the systems to their limits (although I find it really fabulous when someone does). I care about having fun and making a colorful, appealing game, hoping that the fun will be contagious for someone else too through the lens of the game. Looking to release the game on physical media when it's done, somewhere in the far future. Preliminary thoughts is at least c-cassette version for some of the systems and cartridge for the Atari Lynx. I recently got an Atari ST for birthday, so a ST version is also possible if I manage to get a C development environment up and running. *Disclaimer, the whole thing can and will still take a long time to finish. I'm extremely busy as I have a family and a day job. Worst case the whole thing falls on it's face, but let's not think that. Edited by Turbo Laser Lynx, Sat Apr 13, 2019 4:43 PM. As a Vic - 20 collector and fan I have to say your game has a lot of charm! I am looking forward to seeing how it develops! Keep up the great work! Looks very cool! Can't wait to play it when it's released. You'll need to get a Lynx Cartridge Programmer Board to make those Lynx carts I think! Ah that makes sense then! Thanks man! I've been enjoying working on the VIC-20 version a lot. I never knew I'd fall for the VIC-20, I had a C128 as my first computer and only saw a VIC twice back in the day, but the (relative) simplicity of the VIC makes it so much fun to develop for. I love that little computer!<3 I think at first both the release of the 'Cheese & Onion' game and then 8-bit guys VIC-20 Commodore history video also inspired me, because you can tell he really loves that computer. I had to check it up for fun and it seems I've had it ever since late 2015! Actually I was thinking of getting another programmer for backup at some point, but I need to get get so much other retro hardware for testing at the moment, and my economy is not exactly great, so another one is further down the prio list. I recently got a VIC-20, yay! And my friend is trying to restore a broken Plus/4 for me. This is looking really nice, as usual with your games. You really have a nice touch that works very well with Lynx games. Nothing in 1788 ? In the french pre-revolution mind in Paris ? Thank you for the nice words Fadest! Hahaa, I was expecting this! I was thinking if I don't add any landmarks in the background but make it generally steampunkish, it could be "Europe 1888", the exact city would be in the mind of the player. Actually if I somehow have the time I would like to add Transylvania 1788, with a ghosts 'n' goblins kind of mood, but I'm not sure if I can make everything fit and free development time and sometimes energy at the end of a long day is even more an issue. But we'll see! Edited by Turbo Laser Lynx, Mon Apr 15, 2019 6:14 AM. The Vic 20 was my first computer so it holds a very special place in my heart. There is something about the Vic that seems to ooze charm. I always felt it was the "little engine that could" type of machine. The programmers that made games for it had to use so much imagination to get things to work for it and it honestly has a feel all of its own. The Vic 20 is the machine I wish a lot of people would try and see, as I am sure many of them will see the charm in it as well. Please feel free to share some of your experiences porting the game to the Vic, I am sure there are some unique things you may have had to do it get it to work. Edited by imstarryeyed, Mon Apr 15, 2019 4:02 PM. Looks very mario 3 esq. Is the first picture the Lynx version? It certainly looks very nice. Yup, the first one is the Lynx version. ;P Yeah there's so much I'd wanna do but so little time. I've become interested in a lot of the 8-bit era home computers including the CPC. In fact the CPC is top spot shared with the ZX Spectrum on my list to to "Inspect closer" after the 8-bit commodores. Another reason for the systems I've chosen so far is obviously that they share the same cpu, so it's fairly easy to re-use some functions and port stuff between the systems with CC65. I completely agree with you on that, it's super lovely and charming! I'm sure too that people would see its charm if they'd look into it! On the other hand I like the communities of some of the slightly more "obscure" systems, like for example the Lynx, Vic-20 and C16/Plus4, because for example the c64 is so popular that you can't even keep up with all the stuff happening. Well since you kindly ask I will indeed write something about the Vic-20 development so far (and some more backstory). Unfortunately I don't have the time anymore tonight for that wall of text. Edited by Turbo Laser Lynx, Yesterday, 4:56 PM.